Project Scientist is partnering with Concordia University Irvine (CUI) to offer a summer STEM academy for girls between the ages of 4 and 12. Project Scientist Summer Academy will start June 26 in Irvine, CA and will be a five-week day camp with curricula concentrated on science, technology, engineering and math (STEM), with some arts activities as well (STEAM). The camp will operate Mondays through Fridays from 9 a.m. to 5 p.m., with the drop-off time beginning at 8:30 a.m. and pickup time lasting through 5:30 p.m. The camp will run June 26-July 28 on the campus of Concordia University Irvine, located just south of University Drive and the I-405. 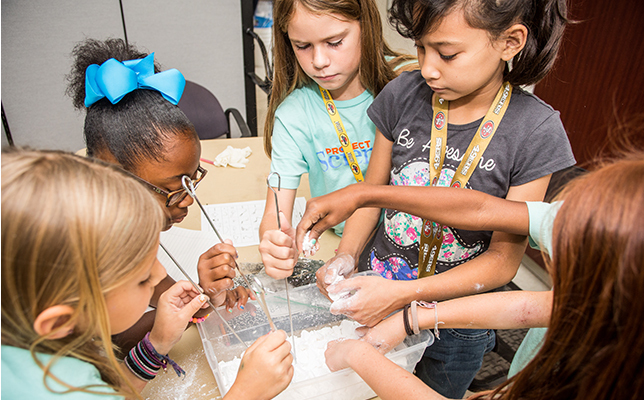 Girls attending Project Scientist will receive instruction from credentialed teachers from the local area, get daily talks and interaction with female STEM professionals from various fields, participate in interactive experiments and engage in activities that involve “teamwork, resiliency, self/group motivation, and trail and error,” according to a news release. Also every Wednesday, students will get on a bus and go on a STEM expedition field trip. The weekly themes will include myth busters, sports medicine, coding and makerspace, designing your world, deep-sea divers and space explorers. The camp costs $725 per week, Marshall said. Forty percent of girls attending come from free and reduced-lunch household and get some type of scholarship or aid, she said. The average student attends between two and three weeks. Concordia University Irvine is one of three university campuses in California offering the Project Scientist Summer Academy. The other two are the University of Southern California and California Institute of Technology. In Charlotte, the academy will take place at the University of North Carolina, Charlotte and Johnson & Wales University. For more information about Project Scientist, visit the organization’s website.